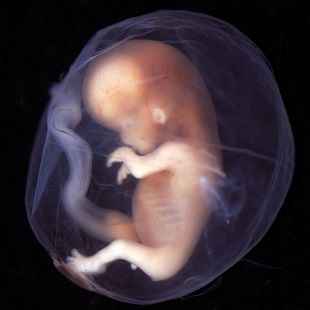 Our reproductive system comes from cells that stem from the embryonic tail. New research out of academia shows the origin of human male genitalia, and how it's tied to the reproductive system in, oddly enough, snakes. The findings, published in the science journal Nature, demonstrate where the external genitalia in both snakes and humans originate. In snakes, genitalia is tied to limb production, or the "limb buds," as snakes once had limbs before evolution gave them the old heave-ho. While a snake no longer possesses arms and legs, this reptile family's external genitalia is made from the same tissue that would make up hind limbs if they existed. During the formation process, the process that would turn these buds into limbs is interrupted, leaving the snake leg-free (no leg day at the gym, I'm afraid). In humans (all mammals, actually), genitalia is tied to the "tail bud," or the cell cluster that forms the embryonic tail. The same applies to birds as well. And while mammals and birds share a reproductive origin story, bird's systems (cloaca) are totally internal, while male mammals are external. These new findings also explains the location of our genitalia. In humans, it's close to the tail bone, and in snakes, it's located where legs would form on most reptiles. And if you prefer more scientific terminology? In squamates, the genitalia develop directly from the budding hindlimbs, or the remnants thereof, whereas in mice the genital tubercle originates from the ventral and tail bud mesenchyme. The recruitment of different cell populations for genital outgrowth follows a change in the relative position of the cloaca, the genitalia organizing centre. Ectopic grafting of the cloaca demonstrates the conserved ability of different mesenchymal cells to respond to these genitalia-inducing signals. The word genitalia was used 13 times in this post, title included.